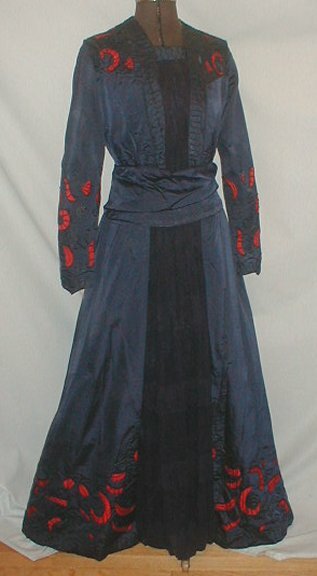 A stunning 1912-1915 Arts and Craft dress that comes from a wealthy CT. estate. The name of the family will be provided to the winning bidder. The dress is made of navy blue satin. 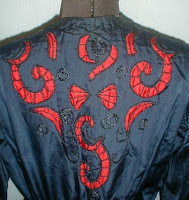 The bodice, sleeves cuffs and lower edge of the skirt are embroidered with rich red satin Arts and Craft pattern that is outlined with navy blue chain stitch embroidery. 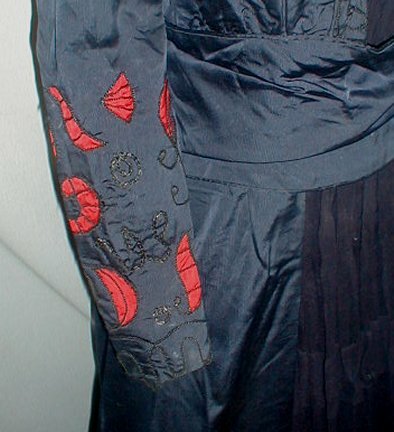 The front of the bodice has a black chiffon insert. The bodice is lined with white silk. 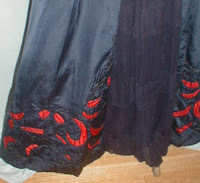 The front of the skirt has a back chiffon panel. It is lined with blue silk. 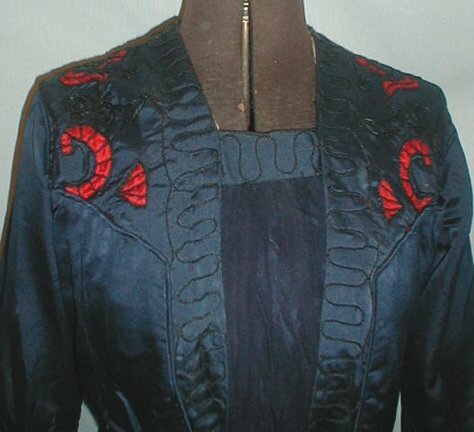 The waist has a wide sash that is trimmed with blue satin decorative buttons. The dress has a front and side snap closure. 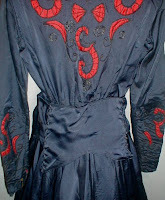 The dress is in very good condition except for the linings in the bodice and skirt that are splitting. 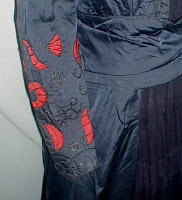 There is a barely visible area of underarm discoloration under one arm one thumb size soil mark on the front of the bodice near the neckline, light soiling on the insides of the cuffs and two dime size soil marks on the edge of one sleeve cuff. 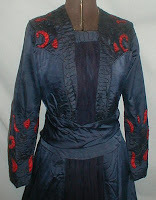 The hat that was worn with this dress is listed in a separate auction. Bust 36 Waist 28. Skirt length 39. It's a wearable size! Yay! 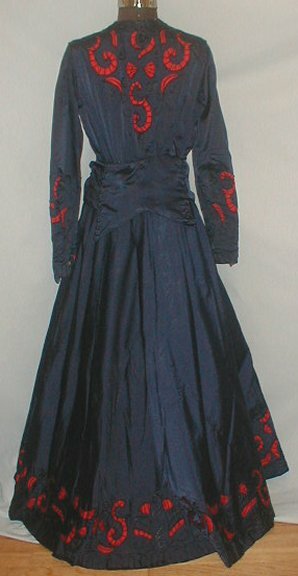 I really like the contrast of the red with the navy blue on this gown. It really is what makes it so striking.